Laidlaw, Z. Protecting Humanity: British Colonialism, Imperial Humanitarianism and the Aborigines’ Protection Society, c. 1830-1870 (Cambridge: Cambridge University Press, Critical Perspectives on Empire series, forthcoming 2019). 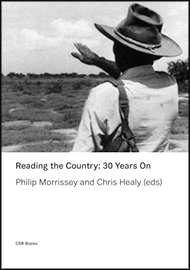 Reading the Country: 30 Years On is a celebration of that book - examining not only its place and time of creation but also its movement across social, philosophical and political surfaces, seeping into the way we look and learn and teach about how people are, or could be, part of country. Blood Will Tell reveals the underlying centrality of "blood" that shaped official ideas about who was eligible to be defined as Indian by the General Allotment Act in the United States. 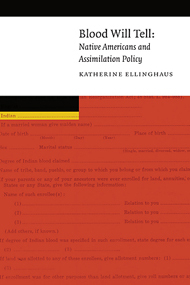 Katherine Ellinghaus traces the idea of blood quantum and how the concept came to dominate Native identity and national status between 1887 and 1934 and how related exclusionary policies functioned to dispossess Native people of their land. The U.S. government’s unspoken assumption at the time was that Natives of mixed descent were undeserving of tribal status and benefits, notwithstanding that Native Americans of mixed descent played crucial roles in the national implementation of allotment policy. The role of blood quantum is integral to understanding how Native Americans came to be one of the most disadvantaged groups in the United States, and it remains a significant part of present-day debates about Indian identity and tribal membership. Blood Will Tell is an important and timely contribution to current political and scholarly debates. Development policy makers and practitioners are becoming increasingly sophisticated in their ability to target 'development' interventions and the psychological domain is now a specific frontier of their interventional focus. 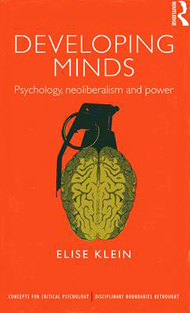 This landmark study considers the problematic relationship between development and psychology, tracing the deployment of psychological knowledge in the production/reproduction of power relations within the context of neoliberal development policy and intervention. It examines knowledge production and implementation by actors of development policy such as the World Bank and the neo-colonial state - and ends by examining the proposition of a critical psychology for more emancipatory forms of development. The role of psychology in development studies remains a relatively unexplored area, with limited scholarship available. This important book aims to fill that gap by using critical psychology perspectives to explore the focus of the psychological domain of agency in development interventions. It will be essential reading for students, researchers, and policy makers from fields including critical psychology, social psychology, development studies and anthropology. 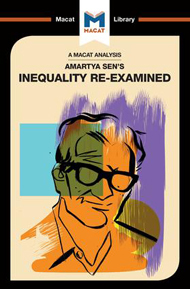 Amartya Sen's Inequality Re-examined is a seminal text setting out a theory to evaluate social arrangements and inequality. By asking the question, 'equality of what'?, Sen shows that (in)equality should be assessed as human freedom; for people to have the ability to pursue and achieve goals they value or have reason to value. The text lays out the fundamental ideas to Amartya Sen's Capability Approach. This approach is celebrated in diverse academic disciplines because of its specific contribution towards the improvement to debates on inequality beyond economic deprivation and utility measures. Furthermore, the arguments put forward by Sen in Inequality Re-examined has had many practical applications throughout policy circles including the Human Development Index, the Multi-Dimensional Poverty Measure, the compilation of lists of capabilities and drawing further attention to human agency and democracy. Amartya Sen won the Nobel Prize for Economics in 1998 for his contribution to welfare economics; the core arguments of this work is found in this book. This book investigates whether and how reconciliation in Australia and other settler colonial societies might connect to the attitudes of non-Indigenous people in ways that promote a deeper engagement with Indigenous needs and aspirations. 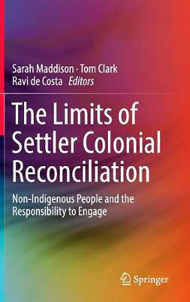 It explores concepts and practices of reconciliation, considering the structural and attitudinal limits to such efforts in settler colonial countries. Bringing together contributions by the world's leading experts on settler colonialism and the politics of reconciliation, it complements current research approaches to the problems of responsibility and engagement between Aboriginal and non-Aboriginal peoples. This book examines approaches to reconciliation and peacebuilding in settler colonial, post-conflict, and divided societies. 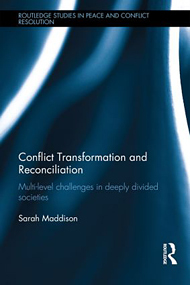 In contrast to current literature, this book provides a broader assessment of reconciliation and conflict transformation by applying a distinctive 'multi-level' approach. The analysis provides a unique intervention in the field, one that significantly complicates received notions of reconciliation and transitional justice, and considers conflict transformation across the constitutional, institutional, and relational levels of society. Drawing on extensive fieldwork in South Africa, Northern Ireland, Australia, and Guatemala, the work presents an interdisciplinary study of the complex political challenges facing societies attempting to transition either from violence and authoritarianism to peace and democracy, or from colonialism to post-colonialism. Informed by theories of agonistic democracy, the book conceives of reconciliation as a process that is deeply political, and that prioritises the capacity to retain and develop democratic political contest in societies that have, in other ways, been able to resolve their conflicts. Debates about children's rights not only concern those things that children have a right to have and to do but also our broader social and political community, and the moral and political status of the child within it. This book examines children's rights and citizenship in the USA, UK and Australia and analyses the policy, law and sociology that govern the transition from childhood to adulthood. 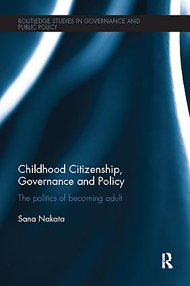 By examining existing debates on childhood citizenship, the author pursues the claim that childhood is the most heavily governed period of a liberal individual's life, and argues that childhood is an intensely monitored period that involves a 'politics of becoming adult'. Drawing upon case studies from the USA, the UK and Australia, this concept is used to critically analyse debates and policy concerning children's citizenship, criminality, and sexuality. In doing so, the book seeks to uncover what informs and limits how we think about, talk about, and govern children's rights in liberal societies. 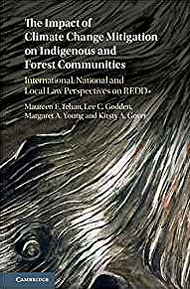 Laidlaw, Z. and Lester, A. eds, Indigenous Communities and Settler Colonialism: Land Holding, Loss and Survival in an Interconnected World. Basingstoke: Palgrave Macmillan, Cambridge Imperial and Post-Colonial Studies series, 2015. 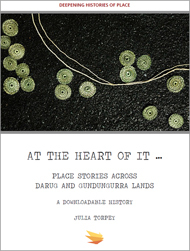 This is a free enhanced ebook located within the context of Ann McGrath's and Peter Read's ARC Linkage Project (LP100100427) "Deepening Histories of Place: Exploring Indigenous Landscapes of National and International Significance," The Australian National University and Sydney University, 2011-2013. PhD student Julia Torpey, who interviewed more than thirty Indigenous people about their histories and storytelling, produced it. Some interviews have been selected here to appear in this ebook from the larger collection of filmed oral histories in place, in The Blue Mountains, Western Sydney and Sydney. This collection of films is not representative of a particular community organisation or 'tribe'; it is representative of individual connection to place and history.